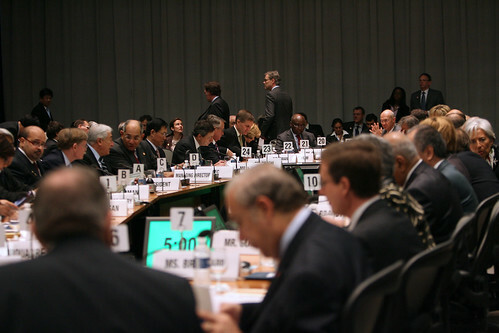 The 2010 World Bank/IMF Spring Meetings have come to a close. See the highlights from the Meetings by clicking on any of the links below. Does working from home limit women’s ability to do business? Anecdotal evidence suggests that working from home makes it easier to balance work and family life. Women may be particularly likely to work from home since they are often viewed as the primary caregivers in the family in most developing countries. However, there is some concern in the literature that family responsibility may limit women’s ability to run a business, leading to fewer hours of operation and lower efficiency for home-based businesses run by women. I wish to share some thoughts on the design of a new governance tool that I recently came across – Grievance Redress and Complaint Handling System, which entails a genuinely focused bottom-up methodology that instills permanent strength to demand-driven accountability. An effective system of complaint handling is characterized by multiple complaint uptake locations and channels for receiving complaints with a standard set of procedures. While this is promising, formalizing and improving already existing informal and traditional structures of grievance redress, such as panchayat village councils in South Asia and chieftaincy systems in Africa, can be easy to manage, cost effective and sustainable. Moreover, many donor projects now mandate formation of local user groups, such as village-road-user-committees, district-road-user committees that comprise of labor employees and beneficiaries of the project and function as watch dogs during project implementation. These groups can be mobilized to institute local grievance redress committees, which would work to address and resolve their concerns and queries pertaining to a project. At an event a few days ago at the Spring Meetings on Africa and the Millennium Development Goals—or MDGs for short—the speaker who left me with the strongest impression of hope for 2015 and beyond was Ted Sitima-Wina, Malawi’s Principal Secretary, Planning. Malawi, a small landlocked country with a per capita income of $280, is on track to meet five out of the eight goals, no small achievement in a region where most countries appear off-track on most goals, and many started from a very low base in 1990. Perhaps one of the most famous steps that Malawi took to cut poverty and hunger was a targeted subsidy which allowed poor farmers to afford fertilizer and hybrid seeds. With this, the country has moved from being a net importer to a net exporter of food. A recent survey showed that over the past few years, people in rural areas have reported that food is available, despite the crisis.